Somebody rightly said ,” All I need is makeup and coffee.” Well , Coffee contains caffeine and antioxidants therefore exfoliating the dead skin & regenerating the new cells. It also removes cellulite from the skin by dehydrating fatty cells and improves blood circulation in the skin to remove it. Enough of science, Have you ever heard of Coffee gel ? Well , until now I didn’t. 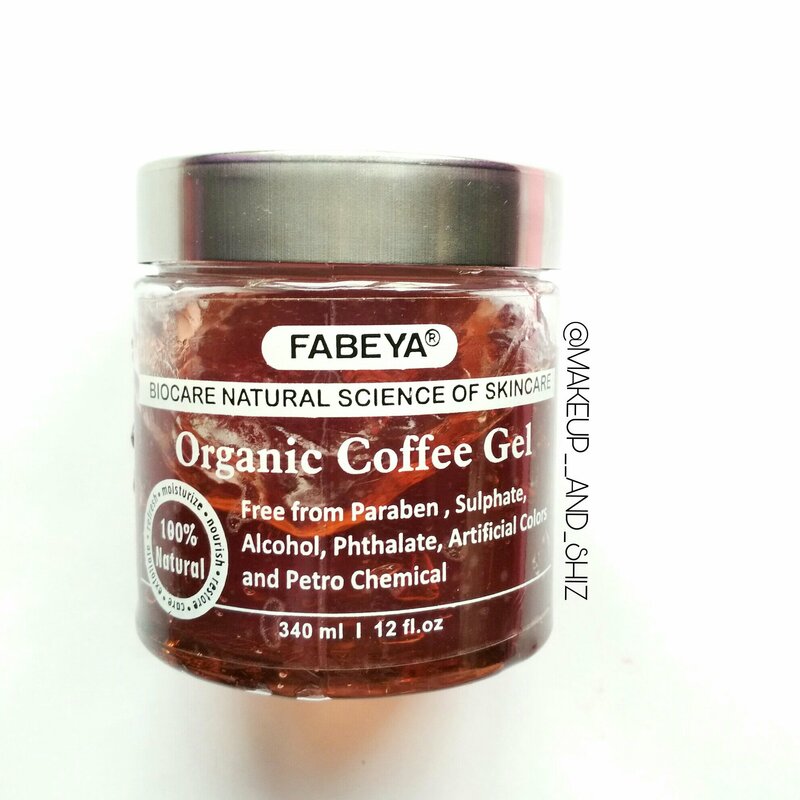 I’m talking about the coffee gel by a recent brand called Fabeya. It is available on Amazon. Click here to buy. How did I use it ? Well, you can read the instructions given and use it the same way . But here are the ways I used and can be used too . As Face pack : I generously applied the coffee gel all over my face. Let it sit for 20-30 mins . Washed it off with normal tap water. As messaging cream : Take required amount of the gel , and start messaging it into your face. Wash it off when you are done. As moisturizer : I often apply it on my hands ( a little amount ) and then apply my moisturizer. Hell yeah. The first time I applied it I didn’t see such change and I thought it was a bleh product . But the next time , Good lord , not just me , people surrounded me noticed the difference too. My face was brighter . It helped in evening out my skin tone –goodbye to all those tiny winy bumps on my face. I feel it also detoxifies and cleans your skin at the same time . Yes, but before that it’s a big tub. Also Fabeya has a variety of gel product. I wanna try some more. Hell Yes ! It’s a good product . This coffee gels needs a try. Read also: FABEYA Cocoa Butter Cream — Review. Helps in evening out . Can be used various ways. That was all for this post . I hope you liked it. Have you tried any such unique product, then do let me know. Previous Start Maker Eyeshadow Brushes – Review. This look really interesting 👌it’s next in my list since I saw them on your Instagram 🙈🙈I have their lemon and papaya gel .. 🤧 I didn’t like them much yeah they are great as a moisturiser but facepack it’s weird..
Yeah , I get it. I will try the papaya next, may be.